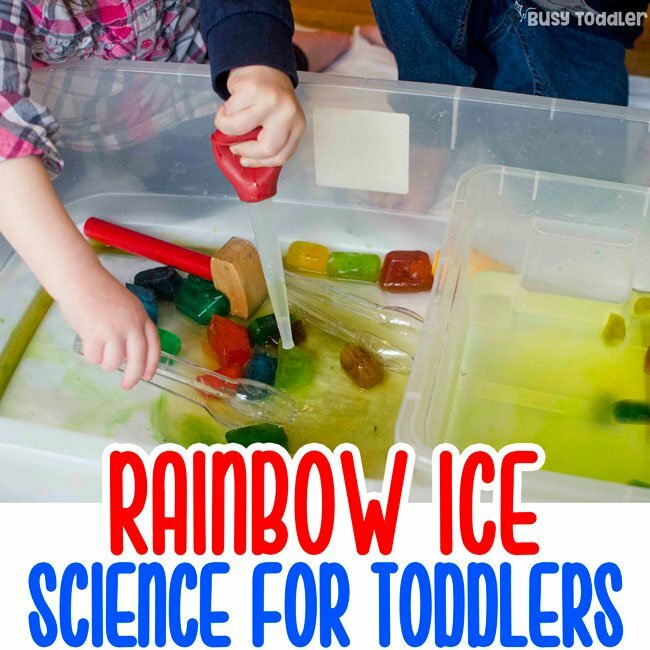 An easy toddler science activity that you need to try. It was late afternoon and the day was dragging. We needed a before dinner activity-pick-me-up but I was at a loss. My mind was blank until my toddler asked me a simple question. She looked up at me with her ever-curious eyes, pointed to the ice in my cup, and said, “Where does the ice come from?”. And in a flash, I knew exactly what toddler science activity we needed to do. 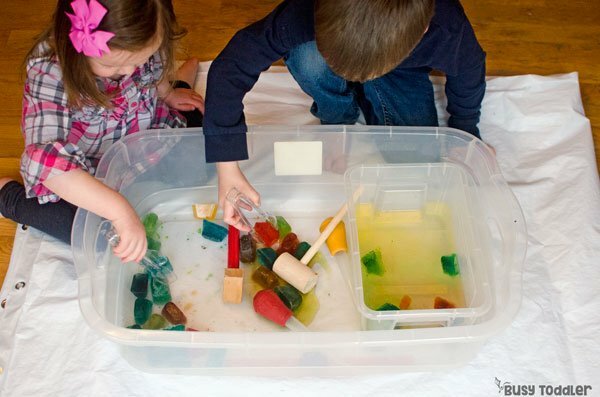 This is one toddler science activity that you’ve got to set up. Even though we have an ice machine, I still love having ice cube trays. 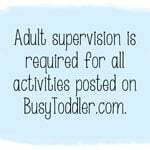 They’re pretty perfect for toddler activities and I use them all the time for non-ice related learning activities and messy play activities. 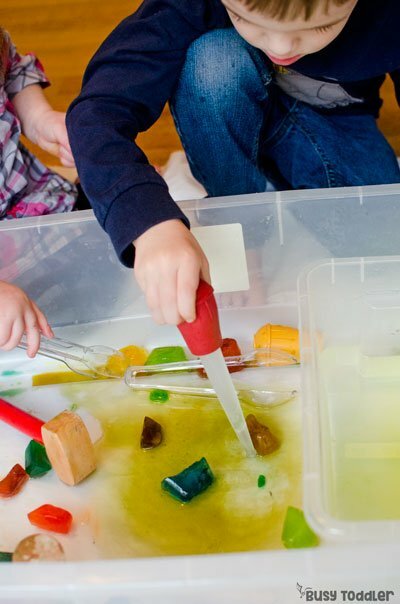 I quickly grabbed all the supplies for this “on the fly”, super easy toddler science activity – I bet you have everything on hand too. 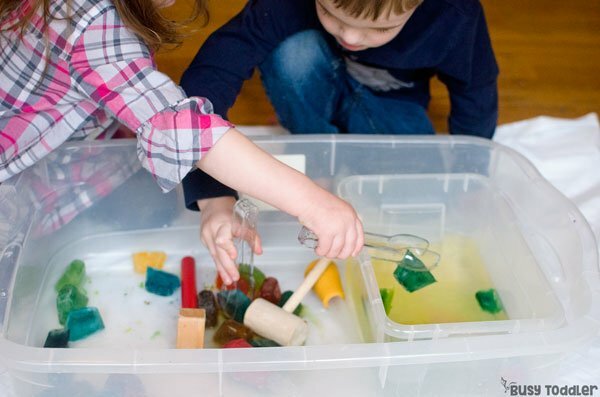 You only need two materials for this activity. You really want to have colored ice for this experiment. I’ll explain why in just a second. 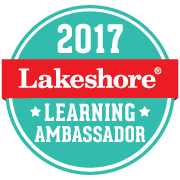 Here’s the teaching part of this activity. I sat my toddler (28 months old) and her (just turned 4 years old) brother on the floor with our ice cube tray, food dye, and a pitcher of water. My son was quick to say that we get ice from the freezer and while that’s right, that’s not exactly the science of it all. So we talked some more and I explained a little secret about water. 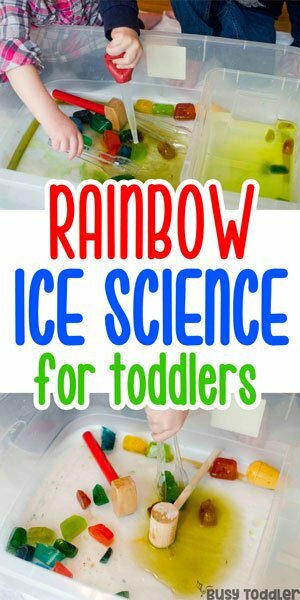 The little trick to teaching toddlers about ice. I explained that water loves to dance. It dances and dances and dances but when it gets cold, it FREEZES. And turns into ice. We now do the ice dance every day. We dance and shake and pretend to be water then FREEZE. We turn into ice. We poured our dancing water into the ice cube trays, added some food coloring to make them fancy (and for a specific reason), and set them in the freezer. 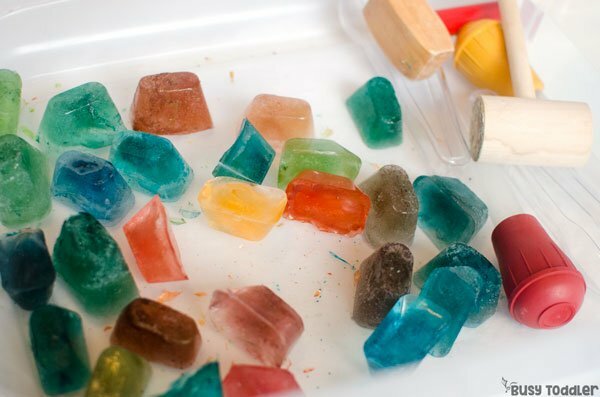 Playing with colorful ice cubes. Activities with ice are some of my most favorite. Toddler’s love playing with ice – but always under direct supervision and only once they are out of the “will put anything in mouth” phase of life. 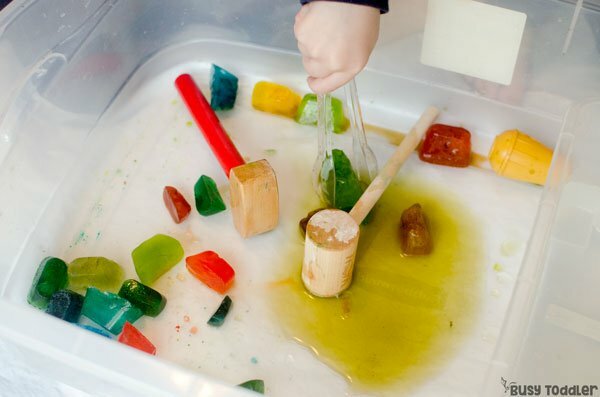 The next day, we grabbed out our colorful ice cubes for some ice cube investigation. I put the ice in a storage container with a second shoe box sized container of warm water. I also added in some tongs, turkey basters, and hammers for added exploring. I didn’t give much direction, if any. 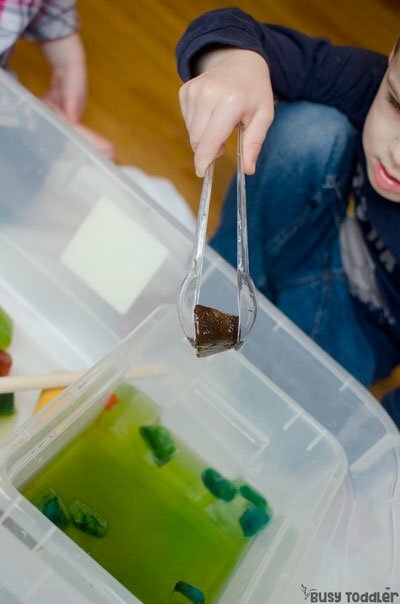 Pretty soon, ice cubes were dissolving in water and my kids were in science heaven. The trick about colored ice cubes is that you can clearly see them dissolving in the water and turning back from ice to water. 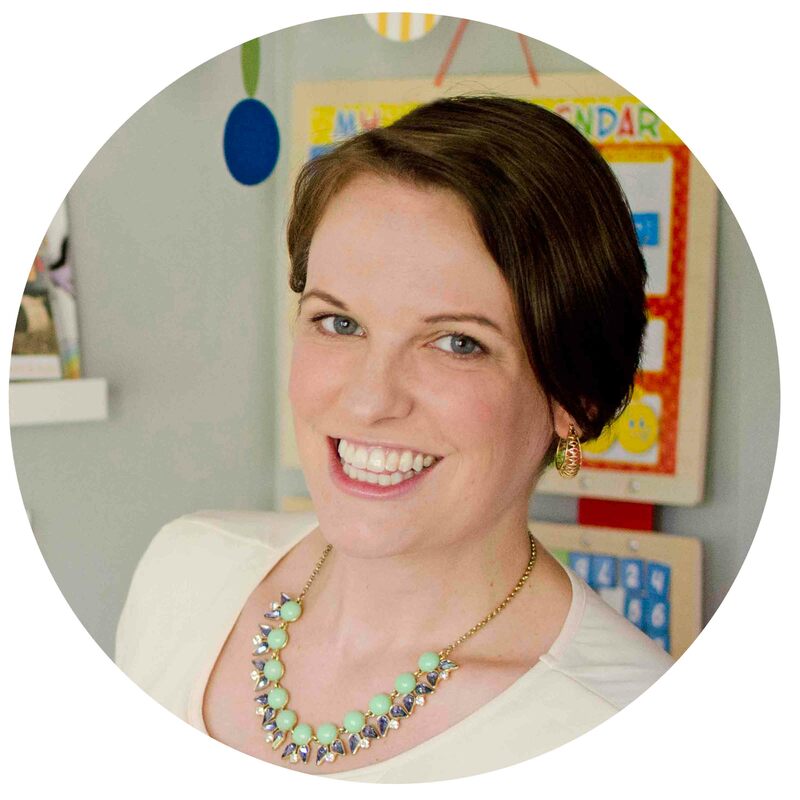 The seeping color makes it easy for toddler eyes to see the transformation. This is key. And why you’ve just got to dye the water. To keep things going, every now and then I would dump out the now cold water for new, fresh warm water. I’d also move the dissolving ice out of the water bin and into the regular bin for smashing and observing. 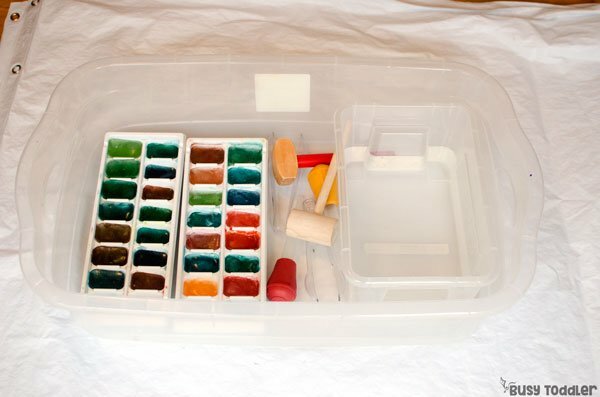 What’s great about this activity is that the ice cube trays can be refilled immediately and frozen again because there will be dye residue on the ice cube trays. It’s like a free set of colored ice just waiting to be used. 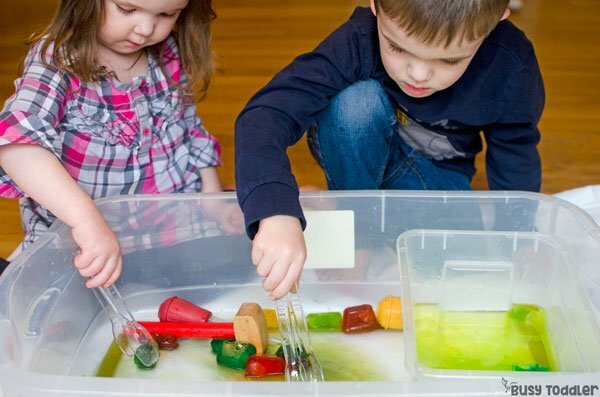 I hope you’ll try this toddler science activity at your house and don’t forget to do the water dance. 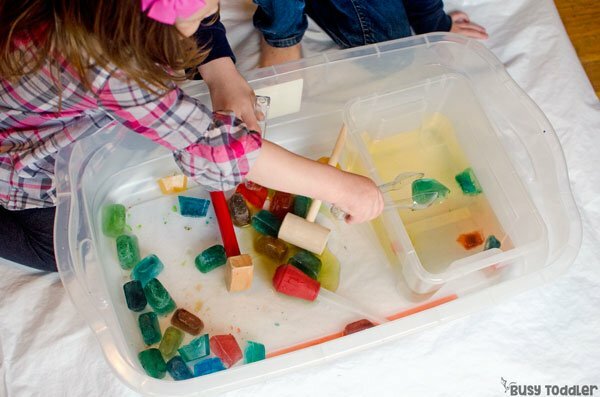 Will you try this toddler science activity with your toddler?